The Articulation module is used between two bones to create a joint where the limb or element will rotate. When you create a bone structure using the Rigging tool, an Articulation module is automatically added between every two bones that you create. 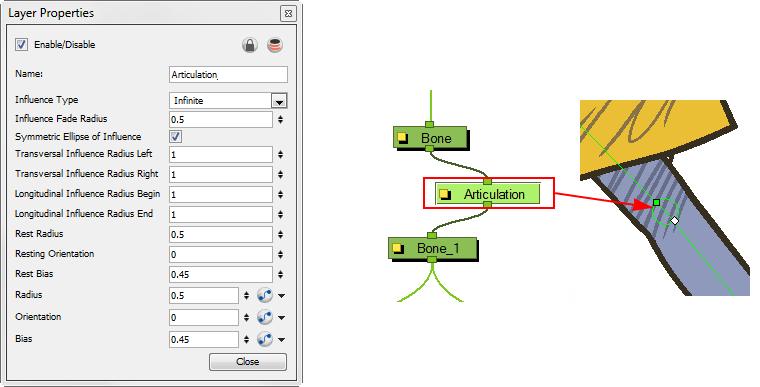 You can also add an Articulation module to your Bone deformation effect in the network to add a supplementary articulation to any existing limb previously built using the Rigging tool and Setup Mode. This module can also be used to manually build a bone structure. The Articulation module works best when inserted between two Bone modules. • Name: Use this field to rename the Articulation module. • Influence Type: Use the drop-down menu to choose between the different Zone of Influence types. This is the area of the drawing surrounding the deformer which will be influenced by the deformation. • Influence Fade Radius: Enter the your Fade Radius value for the Zone of Influence. You can also use the up and down arrow buttons to select a value. • Symmetric Ellipse of Influence: This option is enabled by default. When enabled, the shape of the ellipse will be symmetrical on both transversal and longitudinal radius. • When Symmetric Ellipse of Influence is ENABLED: The value for Transversal Influence Radius Left will define the value for the Transversal Influence Radius Right. • When Symmetric Ellipse of Influence is ENABLED: The Transversal Influence Radius End value will define the value for the Transversal Influence Radius Begin. If you want to define individual values for these, then disable the Symmetric Ellipse of Influence and enter the values required for each. • Transversal Influence Radius Left: When the Symmetric Ellipse of Influence option is enabled, this field controls both the Left and Right Transversal Radius values. When the option is disabled, enter the value in this field to control the size of the Left Transversal Radius. • Transversal Influence Radius Right: When the Symmetric Ellipse of Influence option is enabled, the value in this field will be unused. When the option is disabled, enter the value in this field to control the size of the Right Transversal Radius. • Longitudinal Influence Radius Begin: When the Symmetric Ellipse of Influence option is enabled, the value in this field will be unused. When the option is disabled, enter the value in this field to control the size of the radius at the beginning of the deformer. • Longitudinal Influence Radius End: When the Symmetric Ellipse of Influence option is enabled, this field controls both End and Begin longitudinal radius values. When the option is disabled, enter the value in this field to control the size of the radius at the end of the deformer. • Rest Radius: This is the resting radius of the articulation (size of the circle). You can enter your own radius value directly in this field or use the up and down arrow buttons to set the radius value. • Resting Orientation: This is the resting rotation angle value of the articulation. You can enter your own angle degree value in this field or use the up and down arrow buttons to set the angle value. • Rest Bias: This is the resting bias value of the articulation, which can also be seen as the steepness of the articulation. The smaller the bias value the smoother the articulation angle and the larger the bias value the more angular the articulation is. You can enter the bias value in this field or use the up and down arrow buttons to set the value. • Radius: This is the radius of the articulation (size of the circle). You can enter the radius value directly in this field or use the up and down arrow buttons to set the radius value. When animated, this value will be connected to a function. • Orientation: This is the rotation angle value of the articulation. You can enter the angle degree value in this field or use the up and down arrow buttons to set the angle value of your choice. When animated, this value will be connected to a function. • Bias: This is the bias value, which can also be seen as the steepness of the articulation. You can enter the bias value in this field or use the up and down arrow buttons to set the value of your choice. When animated, this value will be connected to a function.